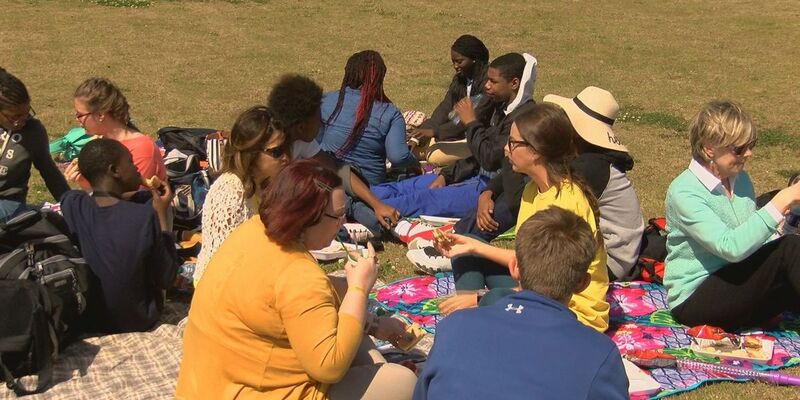 GULFPORT, MS (WLOX) - Students at Gulfport High School are banding together this week for National Youth Violence Awareness week. A barbecue in the courtyard helped bring students together Wednesday. "I think a day like this when you kind of get people out of their routines," said Principal Michael Lindsey. "They don't sit at the same table in the cafeteria. They can come out here, and just mingle and talk to people that maybe they haven't talked to before. And that's been one of the messages throughout the week," he said. Lindsey says he sees how the students at Gulfport High have really embraced the theme of Non-Violence at the school this week. "We just want the kids to know that they belong," said Lindsey. "That this is obviously a welcome place for them to be. And the kids have done a great job. Not only putting that message out there, not only today, but also there's some really good videos that they show each day also." Students took advantage of the opportunity to get to know fellow classmates. "I have seen students who never have talked to each other before sitting together and talking through just life and bringing each other closer together," said Junior Emilie Chenault. "I think it shows everybody is diverse, and how, even though everybody is diverse, that everybody has a chance to somehow come together," said Junior Jayden Magee. "You know, be friends and make this place a great world." And the chance to have some good food with those new friends was a welcomed change from the norm. "We just wanted something where everyone could come out, and enjoy each other at lunch, and build school unity, a little school pride," said Student Council Lead Ellen Buntyn. "So that's what this is all about." "Its purpose is to rally together the students of Gulfport High and just unite us as a school, and bring us closer, and have some good food too," Chenault said. The week will close out with a Unity Day on Friday with a theme of "We are in this together".